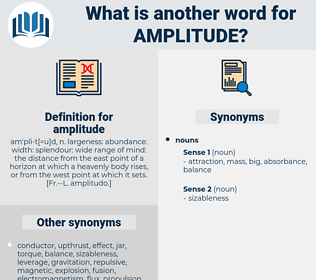 What is another word for amplitude? comprehensiveness, broadness, Extensiveness, enormity, vastness, magnitude, length. insignificance, littleness, smallness, unimportance, tininess, incompleteness. For nothing is of so great and so divine an amplitude as a manâ€™ s soul, after it has gained true freedom and liberty. Let us give the fullest possible amplitude to the scheme. 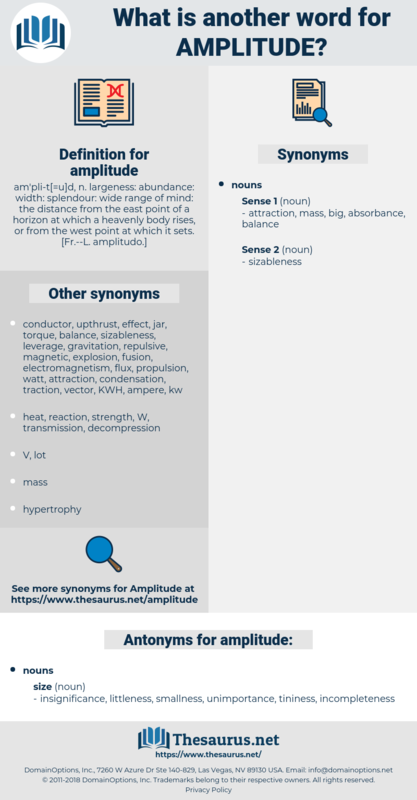 amenability, amiability, amphibolite, aneuploidy, aneuploid, ambulate. signal level, noise level, background level.